Leftover veggies in the fridge? Here's a tasty way to put them to use in a dish the whole family will love. 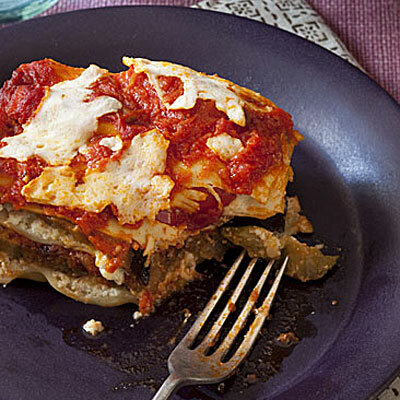 Plus, unlike most lasagna recipes, this one qualifies as relatively low in fat (12 grams per serving, including 6 grams saturated) thanks to ingredients like part-skim ricotta cheese and part-skim mozzarella. This dish delivers a whopping 8 grams of fiber per serving, plus 4 mg of iron and 379 mg of calcium. Make it tonight! Leftover veggies in the fridge? Here's a tasty way to put them to use in a dish the whole family will love. Plus, unlike most lasagna recipes, this one qualifies as relatively low in fat (12 grams per serving, including 6 grams saturated) thanks to ingredients like part-skim ricotta cheese and part-skim mozzarella. This dish delivers a whopping 8 grams of fiber per serving, plus 4 mg of iron and 379 mg of calcium. Make it tonight!